With a whopping 24000 kilometers of trekking trails, the Austrian Alps have numerous trekking trails. 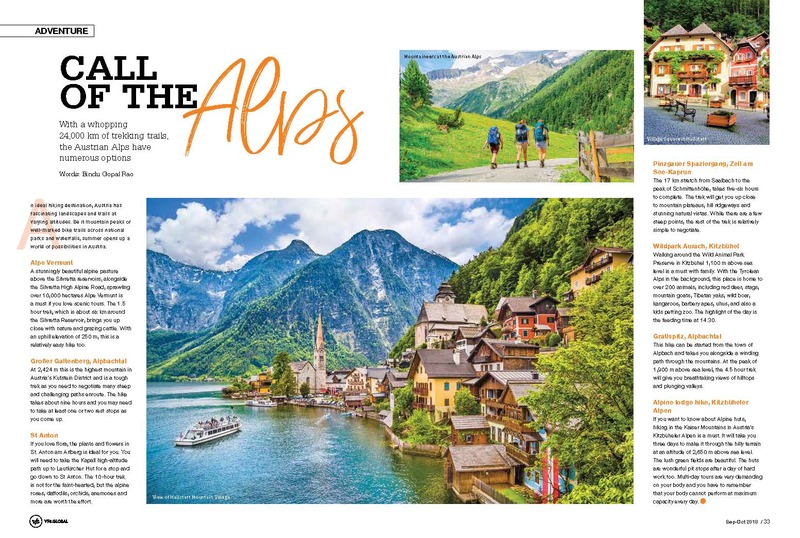 An ideal hiking destination, Austria has fascinating landscapes and trails at varying altitudes that help you explore its national parks, waterfalls, food and more. We list a few for you. A stunningly beautiful alpine pasture above the Silvretta reservoirs, alongside the Silvretta High Alpine Road sprawling over 10000 hectares Alpe Vermunt is a must if you love scenic tours. The 1.5 hour trek is about 6 km around the Silvretta Reservoir brings you up close with nature and grazing cattle. With an uphill elevation of 250 m this is a relatively easy hike too. At 2424m this is the highest mountain in Austria’s Kufstein District and is a tough trek as you need to negotiate many steep and challenging paths enroute. The hike takes about nine hours and you may need to take at least one or two rest stops as you come up. If you love flowers, the plants and flowers in St. Anton am Arlberg home to some plants at specific altitudes is for you. You will need to take the Kapall high-altitude path upto Leutkircher Hut for a stop and go down to St Anton. The 10 hour trek is not or the faint hearted though but the alpine roses, daffodils, orchids, anemones and more are worth the effort. The 17 km stretch from Saalbach to the peak of Schmittenhöhe, takes 5-6 hours to complete. The trek will get you upclose with mountain plateaus, hill ridgeways and stunning natural vistas. While there are a few steep points, the rest of the trek is relatively simple to negotiate. Walking around the Wild Animal Park Preserve in Kitzbühel 1,100m above sea level that has about 200 animals is one that is a must with family. With the Tyrolean Alps in the background, you can see wild boar, deer, lynx, peacocks and more as you play games in the activity stations along the path. This hike can be started from the town of Alpbach and takes you alongside a winding path through the mountains. At the peak of 1900 m above sea level, the 4.5 hour trek will give you breathtaking views of the hilltops and the plunging valleys. While the entire Alderweg or Eagle Walk stretches 280 km, the trek has 24 stages that allow for hikers to break up the trek and choose trails that are as per your needs. If you love art and the outdoors, the six paths in varying degrees of difficultly from easy walks across fields to treks on steep and craggy peaks makes this one interesting and varied too. If you want to know about Alpine huts, hiking in the Kaiser Mountains in Austria’s Kitzbüheler Alpen is a must. It will take you three days and get you up and down at an altitude of 2650 meters above sea level. The lush green fields are beautiful. The huts are wonderful pit stops are a day of hard work too.